1. By day it's a shiny round mason jar (measures 7" Tall and 3" in diameter) with green mosaics and star patterns on the exterior. 2. At night, LED string lights shine through the mosaic glass, providing a whimsical and sweet feel. 3. It is delightful hanging from your porch or using as a tabletop display! 1. There are about 160 mosaic glass pieces, and each of them is meticulously hand glued onto the mason jar; adds the perfect touch of vintage charm. 2. Green mosaics & black mosaics on the exterior make a splash, giving an instant attention to the jar. 3. Mirror-cut mosaics add sparkle and reflect off the surface for a beautiful look you will love. 4. Silver star patterns against light yellow background bring a pop of color and a twinkling lighting effect. 1. Operated by 2 AA batteries (included). 2. With the SET-AND-FORGET timer functioned, the jar light can be left on and will stay on for 6 hours, turn off for 18 hours and then turn on again for 6 hours at the same time as the previous day. 1. A hang ring for easy hanging on porches, windows, etc. 2. A flat base for easy resting on dressers, mantels, shelves and tables at your home. 3. Create a fairy effect indoors and in a covered area. 1. OFF/TIMER/ON switch and battery compartment are on the top of the jar. 2. This light is not a fully waterproof one, to maintain the long life span, you shall keep it from rain or damp environment. 1. Remove batteries if the product is not to be used for a long time. 2. Please handle this product with care to avoid being broken down. 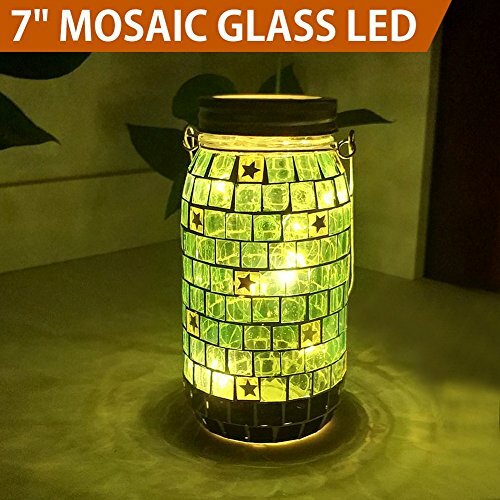 MOSAIC GLASS MASON JAR WITH LED STRING LIGHTS CREATES A FAIRY EFFECT, DAY AND NIGHT - When on, it's a dazzling centerpiece day & night - By day it's a shiny round mason jar (measures 7" Tall and 3" in diameter) with green mosaics & star patterns on the exterior - At night, LED string lights shine through the mosaic glass, providing a whimsical and sweet feel. You will love the way the color reflects off of any surface - It is delightful hanging from your porch or using as a tabletop display! GLASS MOSAICS & STAR PATTERNS - There are about 160 mosaic glass pieces, and each of them is meticulously hand glued onto the mason jar - adds the perfect touch of vintage charm - Green mosaics & black mosaics on the exterior make a splash, giving an instant attention to the jar - Mirror-cut mosaics add sparkle - reflect off the surface for a beautiful look you will love - Silver star patterns against light yellow background bring a pop of color and a twinkling lighting effect. LET TIME BE YOUR CONVENIENCE - Operated by 2 AA batteries (included) - With the SET-AND-FORGET timer functioned, the jar light can be left on and will stay on for 6 hours, turn off for 18 hours and then turn on again for 6 hours at the same time as the previous day - An OFF/TIMER/ON switch on the top of the jar for manual control - Bring a soft luminance to your home at the same time every day without care - When the timer is not in use, just turn ON or OFF the jar as a regular light. FLEXIBLE & EASY DECORATING - A hang ring for easy hanging on porches, windows, etc. - A flat base for easy resting on dressers, mantels, shelves and tables at your home - Wireless; no need for pesky cords or plugs - Create a fairy effect indoors and in a covered area - Easy to coordinate with other home decorations - popular for parties, birthdays, anniversaries, Christmas and daily adornments. Deco 79 71258 Ceramic Jar, 9" by 8"
Deco 79 55313 Metal Wood Wire Jar, 7" by 13"